If you’re a seasoned traveller, you’ll understand why the best travel duffle bags sit among top travel gear for holidaymakers and hikers around the world. They’re lightweight yet they hold a lot. These bags are rugged and often weatherproof, so they’re a great choice if you like to hike or camp. They are versatile coming in a number of styles and configurations. Many travel duffel bags even convert to backpacks, and take up little room when packed away. 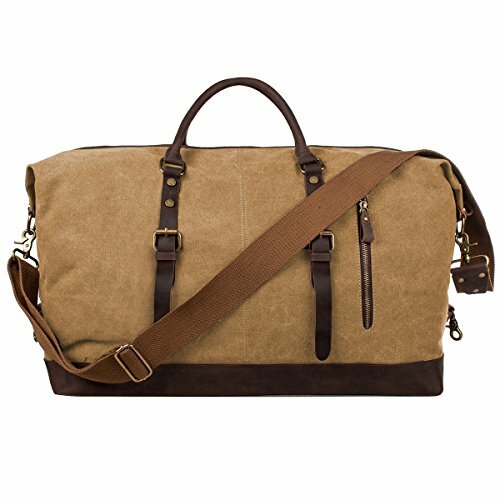 If you’re anything like me and dislike waiting for baggage after a long flight, you’ll appreciate that most duffle bags can accompany you into the cabin. Even a large duffel that isn’t filled to capacity will pass the 22” limit that most airlines will allow in the overhead bins. When choosing a travel duffel bag you want to make sure that it’s made from durable materials. After all, whether you plan to take it to the gym, on a road trip, or on a trip abroad, it’s bound to take a battering over time. The right duffle bag for you will depend on the size you require, and what you plan to do with it. We have taken account of the adaptability of this handy luggage style and reviewed some of the best out there. Around for nearly forty years, the North Face Basecamp Duffel remains a firm favourite among travellers. This top-quality duffel bag is made from a durable laminate material of polyester and urethane. Polyester is hardwearing and lightweight while the urethane makes the bag water resistant. There’s ample room in this 95-litre travel duffle bag. It has a large D shaped opening with a sturdy zip. Use the internal mesh bag on the lid to store any smaller items that you may need quick access to. The end has an additional pocket also containing a mesh bag that’s ideal for shoes or dirty clothing with no loss of volume. The North Face Base Camp Duffel Bag is versatile as it can double as a backpack. It’s a great choice for hiking, the gym or as a weekend bag on your trips away. The straps are adjustable and detachable so you can put them away when not in use. The North Face has recently made some design changes to the old model of this duffel bag. The new version one is sleeker and easier to handle. It’s a rugged bag for the great outdoors, and comes with a lifetime warranty. 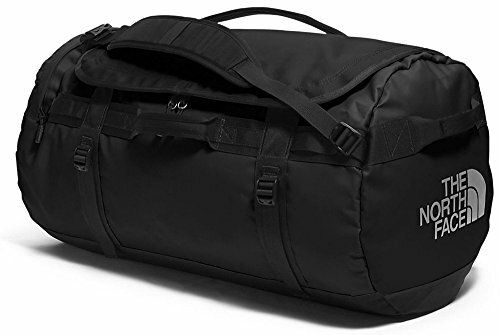 If you’re looking for a travel duffel bag that is made to last, the Patagonia Black Hole Duffel 45L will fit the bill. It’s a solidly made duffel bag. It’s equipped both with handles and backstraps, doubling up as a backpack. The durable ripstop polyester co-laminated with thermoplastic urethane is built to last. This fabric repels water and dirt making it a great bag for hiking. The zippers on the bag are robust, too, and the seams are well-stitched. 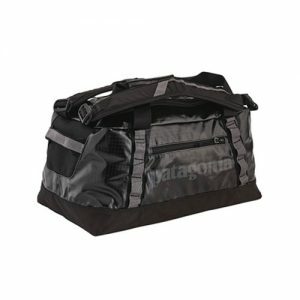 You can choose from four different sizes and five fun colours to make the Patagonia Black Hole Duffel all your own. The Patagonia Black Hole Duffel bag has a single exterior zippered pocket for easy access to small items. It also has two internal mesh pockets on the U-shaped lid. It has a padded bottom, allowing it to hold its shape and cushion blows when tossed around by baggage handlers. This versatile duffel folds up nicely into its own zippered pack for easy storage or to pack into your suitcase so that you can bring your holiday purchases home. The padded shoulder straps on the Black Hole Duffel are very comfortable, and are removable when not in use. It has comfortable webbed handles with a snap closure. You can also use the haul loops on either end of the duffel. Like all Patagonia products, this duffel is made to last. Whether you’re hiking or jet-setting this bag will make a worthy companion. 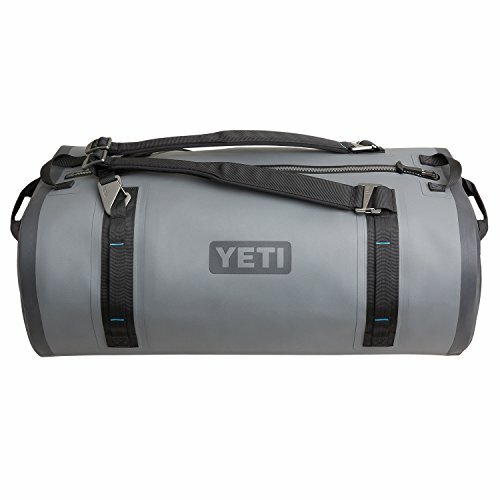 Made from waterproof and abrasion resistant fabric the YETI Panga 75 Dry Duffel is the ideal bag for the outdoors. The patented Thickskin shell and U-Dock will ensure that, even if your bag ends up in the ocean, your gear will stay dry. The shell is made from durable laminated high-density nylon that is almost indestructible. This is a heavy-duty bag with the weight to prove it. The YETI Panga has a long heavy duty waterproof Hydrolock zip that offers easy access to the contents and six patented lashing points for easy grip or for attaching any extra gear that can take the elements. Convert the bag to a backpack by adding the removable, adjustable shoulder straps. The bag has two internal mesh pockets so you can stow smaller items separately. It also features a rigid, padded base moulded from EVA for form and to prevent damage to provide a soft landing. With a 75-litre capacity, the YETI Panga will hold all of your belongings for a week-long trip into the wild. This duffle bag is engineered to keep the elements out and to protect the contents of the bag. The downside of this is that it’s heavy, quite pricey, and not the most comfortable bag to carry. Padded bottom, moulded from EVA. If you’re looking for an inexpensive bag with large capacity the Bago Duffle Bag should fit the bill. With a capacity of 80 litres, the Bago duffel bag weighs just 1.5 kilograms. Bago claims that this is 75% lower than the average bag. This duffel bag also folds up to an extremely packable 11.8” X 12.6”. It zips into itself making storage an absolute breeze. You have no problem packing the Bago Duffle it into your suitcase to take it along on holidays. This is the perfect way to bring your extra purchases home. 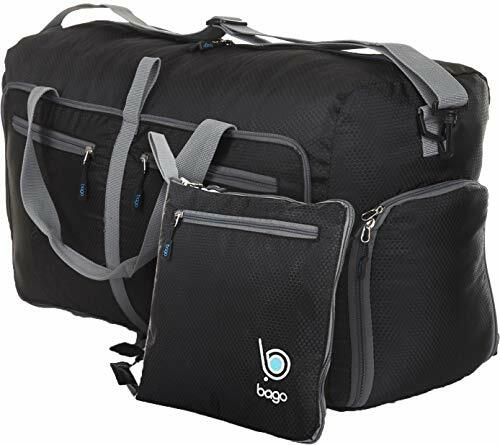 The Bago travel duffel bag is also ideal for the children to pack their gear into when they’re off on a camping holiday as it’s light and durable. There’s also plenty of opportunity for organization. You can store smaller goods in the front & inner pockets of the bag. Made from Honeycomb Ripstop fabric this duffle bag is wear-resistant. The bag includes a shoe compartment that keeps both odours and water at bay; you can use this to separate your shoes or dirty clothing from your clean clothes. It has sturdy corded zips, two handles, and a removable shoulder strap. Unfortunately, one of the downsides is that the shoulder strap is not well-padded; when the bag is full it can be a tad uncomfortable. The Bago travel duffle bag comes in six vibrant colours as well as basic black. If you’re a frequent flier, the large & trendy S-Zone Oversized Duffel is a great choice with a good mix of style & value. This duffel is big enough tohold everything that you may need on an overnight fligh yet small enough to go onto the plane as cabin baggage. The S-Zone Oversized Duffel also makes a good weekend bag with an interior that will fit everything that you need for a few days away. The bag is made from soft and durable high-density canvas adorned with genuine leather crazy horse trim. The hardware will not rust or tarnish as it is made from a zinc alloy. The bag has side pockets for storing smaller items such as cell phones and boarding passes. This unisex duffel bag comes in six different colours so you can match it with your favourite outfit or go for a neutral shade that will fit in with any of your travel gear. Quality craftsmanship and a handy shoulder strap make this bag a winner. On the downside, there have been some reports of zip problems, but the response to complaints has been swift, and the bags have been replaced. If you like the good things in life and love to travel in style then The Polare Genuine Leather Weekender bag ticks all of the boxes. Made from beautiful Italian full-grain cowhide, this bag shouts class, elegance, and professionalism. Leather improves with age and the tailored stitching handcrafted by artisans will last for years. 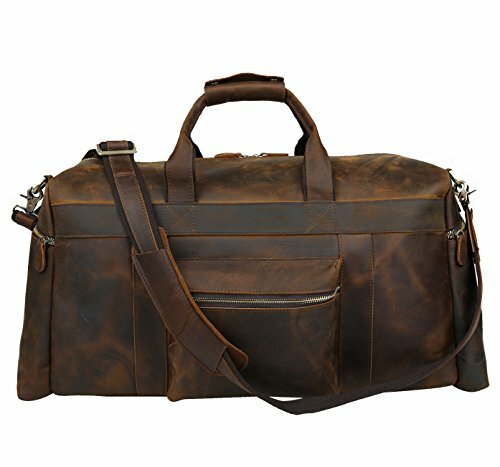 This travel duffel bag is available in two colours, black and dark brown, and two sizes. Polare is a US company that has been in the business of making, what they have styled, men’s leather goods for 15 years. This bag would look equally good as a woman’s weekend bag. This bag is not as large as some of the of the others that we have reviewed. It will serve for a weekend away or for a trip to the gym, but not much more. The Polare Genuine Leather Weekender has both handles and a convenient detachable shoulder strap. Four outside side pockets and another inner pocket provide plenty of opportunities for organization. Overall, this is a durable duffel bag with heavy zippers and well-made handles. The product also comes with a one-year warranty. The leather transfers dark marks onto light clothing. This problem should reduce as the leather wears in. 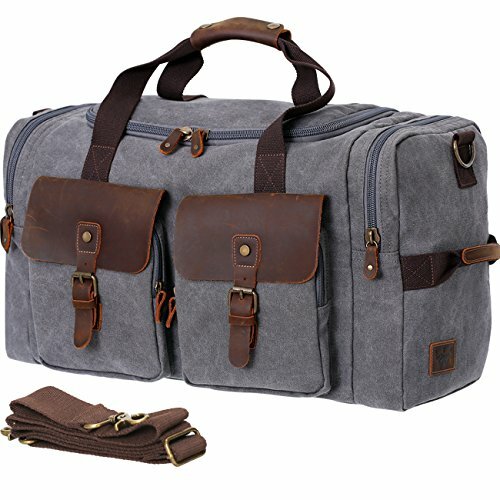 A travel duffel bag designed for men who love organization even when away from home, the WowBox Weekender Bag is a sturdy bag that features front pockets as well as pockets on either end. One of the pockets is intended for shoes so that you can keep them separated from your clothing and the other comfortably fits a laptop. The front pockets are zippered. They also have durable magnetic poppers so your valuable goods are well protected. The large back pocket is zippered and is intended to allow quick and handy access to items such as reservations and boarding passes. The WowBox Weekender has a detachable leather strap so your hands are free to carry any other items that you may bring along with you. It’s also adjustable so you can decide what length is the most comfortable and then lock it in. Although marketed towards men, this bag is unisex in appearance.